As a competitive swimmer who eventually won silver and bronze in the National Sports Festival, Jodi Thornton O'Connell has enjoyed a lifelong love affair with health and fitness. Her background includes certifications as a life health and nutrition coach and extensive work in ancient sound and vibrational healing techniques. Versatile black seedless grapes serve up infinite possibilities that go beyond just popping the succulent orb into your mouth directly from the bunch. The sweet fruit can be cooked into pies and preserves, frozen and pureed to make an easy sorbet, juiced or added whole to salads, for starters. Pair it with blue cheese or herbs such as rosemary, thyme and mint. Best of all, the fruit packs a nutritious punch of vitamins and antioxidants. Read more: What Are the Health Benefits of Black Seedless Grapes? Whether you're looking for a convenient snack right out of the fridge or want to create a healthful dessert, black seedless grapes serve up satisfaction in both taste and nutrition. Per cup, there are just 60 calories in black grapes, compared to 121 per cup of red grapes, according to the USDA Nutrition Database. They're also much lighter on carbohydrates than their colorful cousins, at 16 carbs per cup compared to 30. Nearly all the carbs in the black grape source from sugar, at 15.3 grams. The fiber in a cup of black grapes totals 0.6 grams, and there are 0.66 grams of protein in the same amount. There's even more good news when it comes to black grapes nutrition facts. The fruit delivers 10 milligrams of vitamin C per cup. Although that's not quite as much as red grapes, which have 18 mg per cup, black grapes also have vitamins you won't find in the red variety, such as 66 IU of vitamin A per cupful. The black seedless grapes also have 340 mg of potassium, according to HMC Farms — which grows a variety known as Autumn Royals — as well as 2 percent of the recommended daily allowance of calcium. Dark-skinned grapes are higher in heart-healthy antioxidants than pale varieties, according to the Mayo Clinic. Eating the black-skinned grapes delivers as many of the healthy antioxidants as drinking red wine, with the added benefit of fiber. The low-glycemic index black grapes are a safe snack for diabetics and can support your overall health goals by reducing blood clot risk, lowering bad cholesterol, helping you maintain healthy blood pressure and preventing blood vessel damage. One of the primary antioxidants found in the skin of black grapes in greater amounts than lighter varieties is caffeic acid. Studies in recent years show that caffeic acid can have anti-inflammatory effects and can target harmful chemicals in the body that cause certain types of cancer — particularly breast, oral and colon cancers — to reproduce. Eat one-and-a-half to three servings daily to enjoy the maximum benefit of the antioxidants, according to the book "Grapes and Health, A Monograph." Black seedless grapes' dark coloring also means they contain more polyphenols than red grapes; these include resveratrol, flavonoid and phenolic acid. Resveratrol is the compound most commonly associated with cardiac benefits widely associated with red wine. 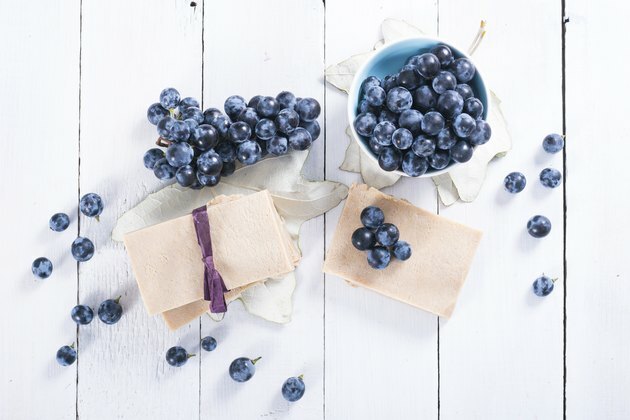 Two randomized, placebo-controlled studies conducted by the University of Oregon found that consuming 8 mg per day of resveratrol in a grape supplement for a year improved inflammation and other conditions associated with atherosclerosis in both participants at increased risk for cardiac disease and those who already had coronary disease. A 2015 study published in the Annals of the New York Academy of Sciences shows that eating fresh, whole grapes or whole grape products is the most effective way for your body to process these benefits. Mayo Clinic: Does Grape Juice Offer the Same Health Benefits as Red Wine? Can Eating Grapes Help Me Lose Weight? What Are the Benefits of Eating Fresh Red Seedless Grapes?